Back to the more normal boating routine. I woke up early this morning and got to work right away. Laundry, grocery shopping, shower, fuel. Between runs to the grocery store, Karen from Daybreak walked by. It turns out that Jerome’s dad is cruising on his boat up here as well, and he’s on the same dock as me. Anyway, I said that I was waiting in town for my dad to arrive on the Alaska Airlines flight, and she said that they were waiting for guests as well. She had rented a car and asked if I needed a ride to the airport to pick dad up. As it turned out I did! After another trip to the grocery store and a shower, Karen swung by and picked me up to go to the airport. This was awfully nice of Karen and saved Dad and me time and money. After getting back to the boat we made one last trip to the grocery store, filled up the diesel tank for the heater/stove, and I installed the new prop that dad had brought with him. I opted for a Solas 13.75” x 13” x 3 blade model. Soon after I got the prop on we were off, around 4:00 PM. Once out of the marina I opened the engine up to WOT to see what kind of performance I got out of the new prop. Loaded heavily, I got 5900 RPM and about 21 knots. Pretty good. Less good is that cruising speed dropped dramatically for a given RPM. 4400 RPM (fast cruise) used to give me 15.5 knots, now I get about 13. To achieve 5 knots (slow cruise) I used to run the engine at 1800 RPM, now I need 2000. Time will tell whether the reduced engine load at these higher RPM’s equates to better fuel economy or not. Today’s destination is Baby Bear Cove, just a few miles past Sergius Narrows. Slack water at Sergius Narrows was around 9:30, so there’s no rush to get up there. We cruised up slowly (even got passed by Daybreak, the slow Nordhavn) and spotted two bears on shore in Neva Strait. One of them was in Whitestone Cove, right where I had anchored a week or so ago. 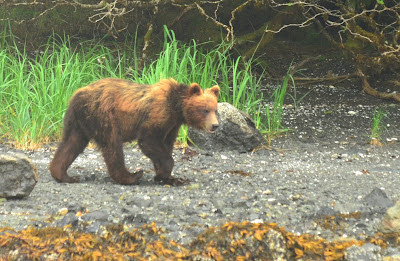 Both bears were fairly skittish, and retreated into the woods quickly after seeing us approach. We passed through Sergius Narrows about an hour before slack and were anchored in Baby Bear Bay 45 minutes after that. We had eaten dinner underway and fell asleep soon after dropping the hook. 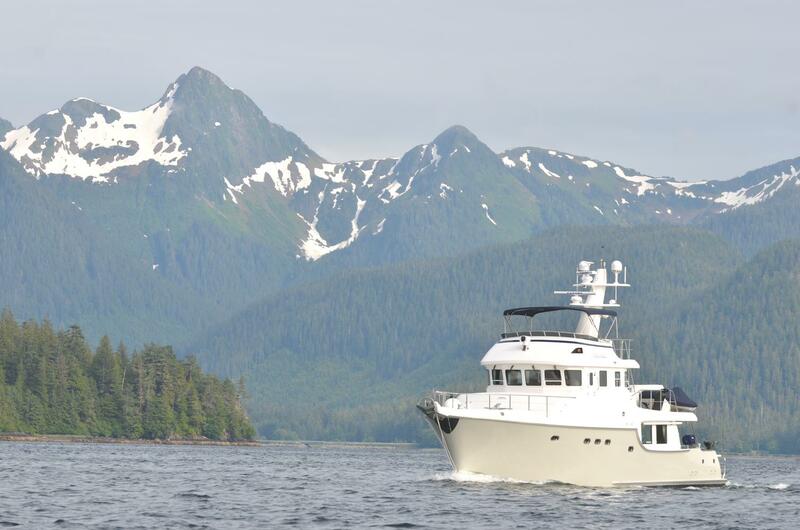 Tomorrow, weather permitting, we’ll head through Peril Strait and down Chatham Strait to Warm Springs Bay. Sam, this is great stuff. I am reading away when I should be working. We have not met in person, but I am JMARTIN on the CW site. I agree, the staff of Twin Bridges is terrific. I am also glad you met the Fisher family. I have been friends of Jerome, Karen, Bob and Joanne for many years.